Tyburn Monastère du Cœur Eucharistique de Jésus in St Loup, France was founded in response to the invitation of Bishop Philippe Gueneley of the Langres diocese. He wanted a contemplative community to come and develop a centre for prayer and hospitality in a large Convent in St Loup, 28 kilometres away from Grancey-le-Château, the birthplace of our Mother Foundress. The new Tyburn community was installed on 29 September, 2013, 112 years after our first Mothers fled to England in 1901 on account of the laws of France against religious Order. The Story of of Tyburn Monastère du Cœur Eucharistique de Jésus. Our monastery is working for the vital re-evangelisation of this region of France. 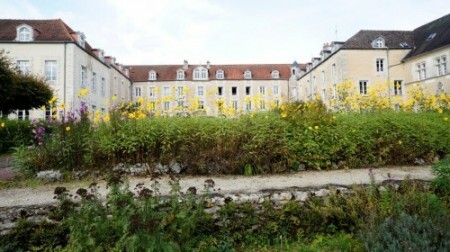 To continue receiving visitors and conference groups; welcoming pilgrims and prayer groups; encouraging participation at Holy Mass, Eucharistic Adoration, and the Divine Office, we need to finalise the purchase of the monastic property, and upgrade and refurbish the buildings to comply with current French law for public access, and fire and safety requirements. Please help us in our Eucharistic Mission. Thank you. View photos here. May God bless you. Please enter the amount you wish to give in EUR, GBP or USD below, press 'Make a donation' and you will be taken through to our secure server hosted by Stripe. Your details will be taken by Stripe's online form. Thank you. May God bless you.